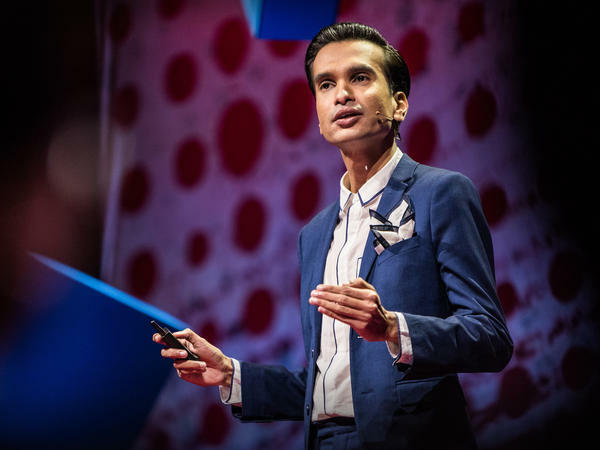 Kaustav Dey: How Can Fashion Shape Identity? Kaustav Day on the TED stage. Part 5 of the TED Radio Hour episode The Person You Become. For Kaustav Dey, fashion can embolden us to express our unique identities. He describes how the clothes we wear can give us freedom to choose how we want to look and how we want to live. Kaustav Dey is the head of marketing for Tommy Hilfiger & Calvin Klein India. He's interested in the role of fashion as a form of protest, in his own life and in the fashion industry. Dey earned a bachelor's degree in electrical and electronics engineering from Madras University in Chennai. He also holds an MBA in marketing and communications from MICA in Ahmedabad, India. On the show today, ideas about The Person You Become. And one of the ways we identify ourselves and how others identify us can come from something as simple as the clothing we wear. KAUSTAV DEY: To me, what I think what we wear signifies is - it's just a celebration of self. RAZ: This is Kaustav Dey. He works for Tommy Hilfiger and Calvin Klein in India. Does that mean you get to wear all the Tommy Hilfiger and Calvin Klein apparel you want? DEY: I'm wearing it right now. RAZ: Can you describe your outfit? DEY: Well, I'm wearing these vintage pants that are really baggy, high-waisted, you know, like the ones from the '70s. And I'm wearing a Tommy Hilfiger T-shirt. I thought I'd be comfortable today. RAZ: Tell me about how you first became drawn to fashion. When - how did that begin? DEY: By chance. I grew up in a city called Chennai in the south of India. And I had very limited exposure to anything fashion. All I knew was my school uniform. That was what I wore every day of my life. That's what I found solace in. I was not macho. I was terrible at sports. And everything that was expected of me, I failed at. And as a consequence, I was bullied. And I felt a sense of safety from looking the same as everyone else in my school uniform. And I chanced upon these - this pair of pants that belonged to my father from his college days. And it was corduroy and bell-bottomed and high-waisted. And it really struck me that if I were to wear this, as opposed to my school uniform, I would look completely different from everyone else. And why should I not do that? My mother had these '80s-style blouses which had the big shoulder pads, if you recall. DEY: She didn't want them, so she'd cut the shoulder pads off. And what I did was I found them fascinating, so I saved them. And on this day, I decided I would see what would happen if I wore these black corduroy bell-bottom pants. They were too big for me. I also decided to take the shoulder pads and affix them with safety pins to the insides of my shirt. And I was really one of the strangest things you would have ever seen. RAZ: Kaustav Dey picks up the story from the TED stage. DEY: And once I pulled on those god-awful pants and belted them tight, almost instantly I developed what can only be called a swagger all the way to school and then all the way back because I was sent home at once. I transformed into a little brown rock star. I finally didn't care anymore that I could not conform. That day, I was suddenly celebrating it. That day, instead of being invisible, I chose to be looked at. That day, I discovered the power of fashion, and I've been in love with it ever since. Fashion can communicate our differences to the world for us. And with a simple act of truth, I realized that these differences, they stopped being our shame. They became our expressions, expressions of our very unique identities. RAZ: How much of a connection is there between how you express yourself in fashion and in telling people who you are and what your - what you identify with and as? DEY: I think the connection is as strong or weak as one chooses it to be. I chose to dress at an earlier age deliberately differently from the rest of the young boys that I was growing up with. And that was something I was trying to say. My identity at that point of time was that I'm different from you, and I'm going to celebrate that, and that I did by wearing what I loved. And I felt a sense of liberation, of escape, of power from that. And fashion is what gave me that voice without words to do that. If you express it, it becomes a celebration, not an aberration. That's something that speaks to me tremendously. And what I wear and fashion has been possibly the most important factor in me being who I am today. RAZ: It really does make sense - right? - because there has to be a connection between what we wear and how we start to think about the kind of person we are. DEY: Oh, absolutely. And even when I was a young guy, I dressed for the man I wanted to grow into. And again, you know, I know I speak of fashion, but fashion is fashion at the end of the day. It's not that serious. What remains is the emotion that the clothes leave behind and what you want to take away from it. DEY: My grandmother was a woman who took extraordinary pleasure in dressing up. Her fashion was colorful, and the color she loved to wear so much was possibly the only thing that was truly about her, the one thing she had agency over, because like most other women of her generation in India, she'd never been allowed to exist beyond what was dictated by custom and tradition. She'd been married at 17. And after 65 years of marriage, when my grandfather died suddenly one day, her loss was unbearable. But that day, she was going to lose something else, as well - the one joy she had, to wear color. In India, according to custom, when a Hindu woman becomes a widow, all that she's allowed to wear is white from the day of the death of her husband. She passed away this year. And until the day she died, she continued to wear only white. I have a photograph with her from earlier, happier times. In it, you can't really see what she's wearing. The photo's in black and white. However, from the way she's smiling in it, you just know she's wearing color. This is also what fashion can do. It has the power to fill us with joy, the joy of freedom to choose for ourselves how we want to look, how we want to live, a freedom worth fighting for. RAZ: So that choice - that choice to change the way she dressed - completely changed her identity. DEY: Yes, yes. After her husband died - my grandfather - every identity that she had was robbed of her. And her wearing white immediately identified her in India as a widow, and her identity became one of that as a widow. What she had achieved, the family she had so lovingly nurtured, none of that mattered anymore. She was a widow with all of its baggage around it. That was devastating to her. DEY: Widows in India like my grandmother - thousands of them live in a city called Vrindavan. Only as recently as 2013, the widows of Vrindavan have started to celebrate Holi, the Indian festival of color, which they are prohibited from participating in. On this one day in March, these women take the traditional colored powder of the festival and color each other. With every handful of the powder they throw into the air, their white saris slowly start to suffuse with color, and they don't stop until they're completely covered in every hue of the rainbow that's forbidden to them. For that moment in time, it's their beautiful disruption. This disruption - any kind of dissonance - can be the first gauntlet we throw down in a battle against oppression, and this we can say without a single word. Fashion can give us a language for dissent. It can give us courage. Fashion can let us literally wear our courage on our sleeves, so wear it. Wear it like armor. Wear it because it matters, and wear it because you matter. Thank you. RAZ: That's Kaustav Dey. You can find his full talk at ted.com. THE KOOKS: (Singing) Da-da-da-da-da-da-da-da-da (ph). Be who you are. Da-da-da-da-da-da. Be who you are. Da-da-da-da-da-da-da-da-da. Baby, you're a star. Da-da-da-da-da-da. RAZ: Hey, thanks for listening to this episode, The Person You Become. If you want to find out more about who was on it, go to ted.npr.org. To see hundreds more TED Talks, check out ted.com or the TED app. Our production staff at NPR includes Jeff Rogers, Sanaz Meshkinpour, Jinae West, Neva Grant, Rund Abdelfatah, Casey Herman, Rachel Faulkner and Diba Mohtasham, with help from Daniel Shukin and Lawrence Wu. Our intern is Megan Shellon (ph). Our partners at TED are Chris Anderson, Colin Helms, Anna Phelan and Janet Lee. I'm Guy Raz, and you've been listening to ideas worth spreading right here on the TED Radio Hour from NPR. (SOUNDBITE OF THE KOOKS SONG, "BE WHO YOU ARE") Transcript provided by NPR, Copyright NPR.